For nearly 20 years, R&D Fixtures has been providing food merchandising equipment to some of the largest retail supermarkets in the United States and Canada. Pioneering in innovative, quality products, we offer competitive prices and inventive solutions for all your merchandising needs. R&D Fixtures is at the forefront when it comes to customization to match your branded decor - whether it be a salad or soup bar to coordinate within existing equipment or a complete new layout to bring cafe style food service to your customers. 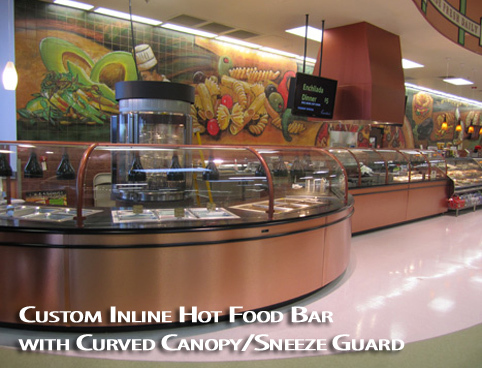 We've taken that concept and brought it forward with the Decor Match Series salad and hot food bars. Metal Frame Construction and removeable side panels make maintenance and decor changes easy. Read more about this innovation and see how it works. Our equipment is built with durability, flexibility and efficiency in mind. We are constantly improving our product line to include energy efficient and environmentally friendly features. R&D Fixtures is devoted to making our equipment, response time, and services the best in the industry.